Seasonal promotions, especially around the holidays, seem to come earlier and earlier each year. Already, as of September 2015, a staggering 59% of US and UK retailers had kicked off their annual holiday ad blitz. Yet these traditional tactics from the retail industry may be doing more harm than good as social media becomes increasingly important to the shopping experience—with customers placing ever greater value on service. The Q4 2015 Sprout Social Index reveals a disconnect between what shoppers are seeking and what retailers are delivering. Last year, in the period leading up to the holidays, the retail industry saw a 21% spike in messages from consumers. 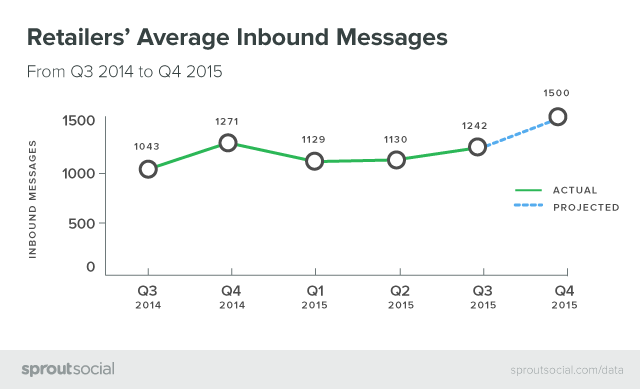 If this trend continues, the average retailer can expect 1,500 inbound messages on social this holiday season. 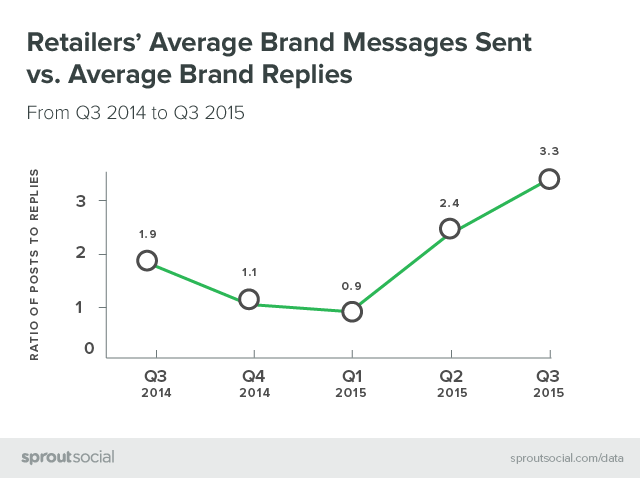 But retailers are not entirely absent from social. In fact, they are sending out a whole slew of messages—just mostly about themselves. According to The Q4 2015 Sprout Social Index, retailers now send about 3 times as many promotional messages as they do helpful replies to customers throughout the year. While somewhat discouraging, this figure also speaks to an incredible opportunity for wise retailers who choose to invest in social customer care. Indeed, Rosetta Consulting notes that people are 7 times more likely to respond to a brand’s promotional messages after being engaged in some meaningful way. That is to say, promotions matter, but engagement should take precedence. To help retailers better meet customer demands and bolster their social promotions, The Q4 2015 Sprout Social Index analyzes major trends for the industry in terms of brand response rates and times. After digging through the data, and referencing historical performance, we distilled several actionable insights to ensure teams are prepared to keep pace with the sometimes cacophonous mix of messages that pour in around the holidays. We also gathered advice from some of the industry’s leading social media experts, who know what it takes to be effective in reaching customers throughout the entire year. Download the full Q4 2015 Sprout Social Index below to gain a deeper understanding of how responsive retail is as compared to 14 other industries across the globe. We hope that these insights prove to be invaluable to businesses everywhere—while ensuring that retailers have an especially happy holiday.